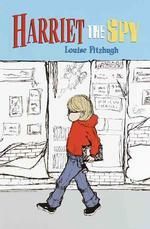 The book of this month (as most of you probably know already) is Harriet the Spy. A book about an eleven year old girl named Harriet who go’s around and spy’s and writes down everything about everyone she sees in her notebook… most of them pretty mean remarks. Then it falls into the wrong hands and the whole school seems to be mad at her… the start of a war. Both emotional and exciting, this book is great for girls and boys alike. Now I’d like to see if anyone can guess the next book of the month. Its about a girl who loves to wish on anything (and everything). Her twelfth birthday is coming up and she just can’t wait for her parents have promised her many things over the years that she could do when she turned twelve and she wrote it all down on scraps of paper and put them all in a box under her bed. If you think you know the answer, please post a comment before June first. still no guesses? need a hint?